This HCI (Human-Computer Interactions) course will explore the design space of Tangible User Interfaces (Tangible Bits and Radical Atoms) that give dynamic physical form to digital information and computation. Our goal is to broaden the bandwidth of interaction between people and digital information, through the invention of new digital/physical materials that help us to design, communicate, and express using the full range of human senses and skills. We will pursue interfaces that are not only practical, but also aesthetic and inspiring. This is a project-based interaction design course centered around hands-on technological tutorials for prototyping, design workshops, literature on tangible user interfaces, dynamic shape displays, programmable materials, with two major projects, as well as various guest lectures from relevant fields of HCI, interaction design and enabling technologies. Students will design and develop experimental user interfaces, applications, and/or enabling technologies using sketches, animation, physical mockups, and working prototypes to solicit studio discussion. Course enrollment is limited to around 30 to keep a design studio atmosphere. In 1997, we presented our vision of “Tangible Bits” at the CHI ’97 conference. We proposed the concept of Tangible User Interface (TUI) that is based on physical embodiment of digital information and computation, in order to go beyond the current dominant paradigm of “Painted Bits” or Graphical User Interface (GUI). Humans have evolved a heightened ability to sense and manipulate the physical world, yet the GUI based on intangible pixels takes little advantage of this capacity. The TUI builds upon our dexterity by embodying digital information in physical space. TUIs expand the affordances of physical objects, surfaces, and spaces so they can support direct engagement with the digital world. Through the design of a variety of TUIs, however, we have learned that TUIs are limited by the rigidity of “atoms” in comparison with the fluidity of “bits.” TUIs have limited ability to change the form or properties of physical objects in real time. This constraint can make the physical state of TUIs inconsistent with the underlying digital models. 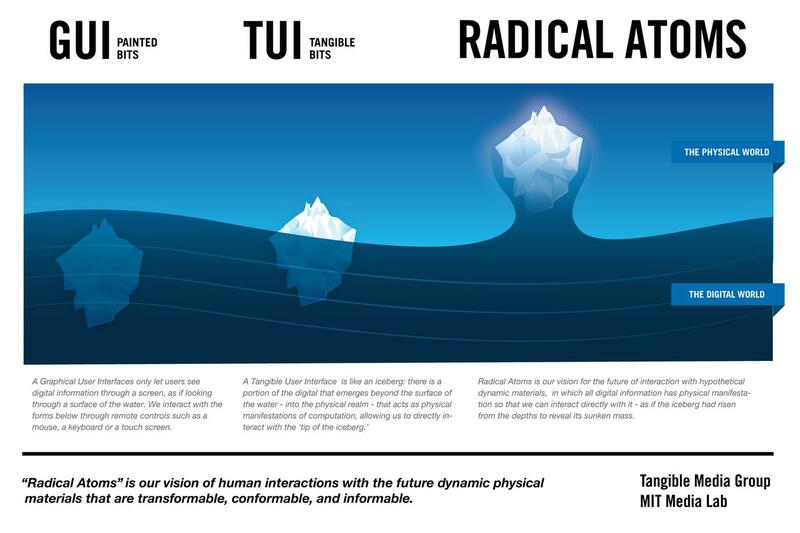 To address this challenge, we presented our new vision, “Radical Atoms,” in 2012. Radical Atoms takes a leap beyond Tangible Bits by assuming a hypothetical generation of materials that can change form and appearance dynamically, becoming as reconfigurable as pixels on a screen. Radical Atoms is a computationally transformable and reconfigurable material that is bidirectionally coupled with an underlying digital model (bits) so that dynamic changes of physical form can be reflected in digital states in real time, and vice versa.